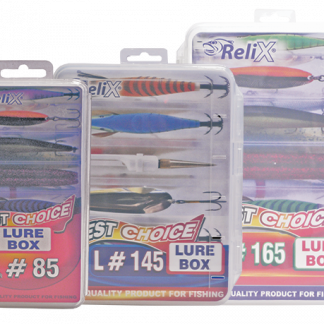 Relix’s Smart Lure Boxes take away all the trouble of tangled lures. Relix’s double sided Smart Lure Boxes are specifically designed to solve this problem. Their triangular compartments allow lures and jigs to be stored efficiently on both sides of the box. This means you can store more lures in a smart box without the mess, and are all fitted with drain holes to keep water from accumulating inside the box causing lure hooks to rust. Ideal for hard bodied lures, but also highly recommended for Squid Jigs and leadfish lures aswell. L 85 : 88mm x 190mm x 32mm. L 145 : 170mm x 204mm x 44mm. L 165 : 190mm x 275mm x 47.5mm. 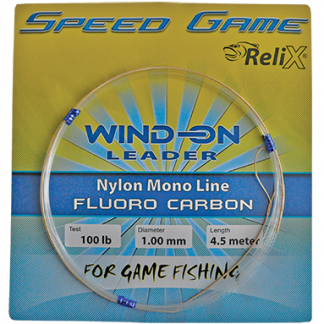 Relix introduces its new Speed Game Wind- On leaders that feature their high performance Fluorocarboncombined with low stretch Dyneema to create a strong, reliable vitually invisible wind-on leader. Relix Speed Game Wind-On leaders are attached with a loop to loop connection to your fishing line. The wind -on system improves bait presentation, eliminates the need for conventional long leaders and provides safer handling and releasing of fish at the boat. Available in 8.5mt : 50lb, 80lb, 100lb & 150lb. 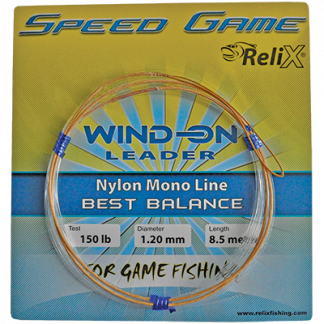 Relix introduces its new Speed Game Wind- On leaders that feature their high performance Best Balance mono combined with low stretch Dyneema to create a strong, reliable wind-on leader. Relix Speed Game Wind-On leaders are attached with a loop to loop connection to your fishing line. The wind -on system improves bait presentation, eliminates the need for conventional long leaders and provides safer handling and releasing of fish at the boat.